Szoke Tisza (1917-74), the former Danube cruiser is best known as PS Felszabadulas, the name she assumed in 1950, having been IV Karoly, and between 1930 and 1950, Szent Imre. In 1958, 175 berths were built into the vessel as she was assigned to overnight cruises from Budapest. Briefly used as a canteen ship for her owners, she was sold out of the MAHART fleet in 1979 to the city of Szeged for use as a hotel. When owned by a commercial Danube cruising company, partners in the Zoltan Foundation ship museum at Nezsmely, plans were drawn to refurbish her for Danube service, but to date, progress has been fraught with technical and financial problems and ownership has new reverted to the Tiszayacht shipyard company at Szeged where she remains . Following her sinking in early 2012 as her hull cracked as the surrounding water melted after the winter freeze, the ship was srapped in the late autumn of 2012 although her engines and certain internal fittings were saved. 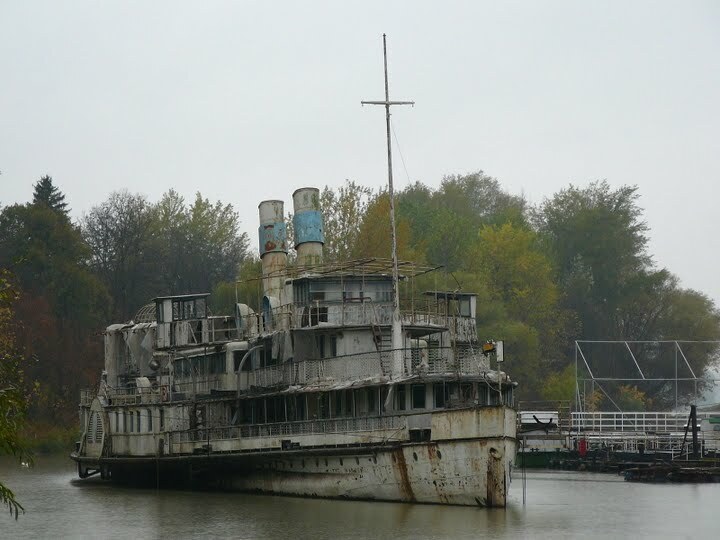 A former buoy tender vessel, she was latterly laid up in derelict condition on the Danube at Giurgiu, She sailed until 1991. With surviving Escher-Wyss compound diagonal machinery dating from 1903, the ship originally built at Turnu-Severin, attracted the attention of Swiss preservationists with a view to using the hull in a proposed replica of the River Aare paddler Wengi (1856). The Romanian government, however, decided she should remain locally and may now become a museum ship. In August 2010 she was sold to beer and cigarette retailer Nicost SRL of Galati for 7903 Euros at an auction held by the Lower Danube River Administration. The former Lake Como paddler served as a floating restaurant at Lago di Mezzola, with engines and boiler removed. The 1903 Zurich-built steamer had been at Colico between 1970 and 1999 as a restaurant and clubhouse. Out of use, although still owned by the owner of the nearby Restaurant La Barcaccia, she was in severe danger because the local authorities in charge of the Nature Reserve within which she lies have demanded her removal by the end of September 2008 from the lakeside at Verceia. This never happened but she sank at her moorings on 9th December 2010 as severe winds swept the lake. 2010 : Built in 1940 by A&J Inglis of Glasgow for the Hull-New Holland service across the Humber Estuary on England's east coast. She served until 1978, the route being made redundant by what was then the world's longest suspension bridge. She then served as a floating restaurant at Hessle near Hull then at nearby Grimsby on the south bank of the Humber. Closed in 2006 and in need of urgent hull repairs, she was scrapped in September 2010, despite the efforts of a local preservation society to buy her. The owner believed that the cost of repairing the bottom of the ship, itself not easily removable from the dock in Grimsby would have been prohibitive for any party. 2010 : It is suspected that MV Baldo, a former paddle steamer built by Odero in 1900 for use of Lake Garda, Italy, was scrapped. The paddler was converted to being a screw motor ship in 1925 (similarly to the existing Milano on Lake Como), but lost any resemblance to her original profile in 1959 when she was rebuilt to look similar to a number of other motor ships in the Lake Garda fleet. She was still sailing in 2008 but after withdrawal, the most prominent proposal for her future was to sink her as a reef for divers. It is believed that this never happened and the ship was scrapped. 2006 : The 1924-built River Thames and Medway paddle steamer, which had been out of service since 1963 was eventually dismantled in situ at the Hoo peninsula near the mouth of the Medway after many years of preservation efforts. However, important structural elements and fittings were saved and carefully catalogued in a controlled dismantling as funding had been sourced for a complete new build hull. The intention is to complete the construction of a working replica incorporating elements of the original ship as a historical exhibit on the Medway. Built at the Sormovskiy Shipyard at Nizhny-Novgorod in 1905, the last surviving River Volga paddler was laid up in Pamyat Parizhskoi Kommuny (Nizhniy Novgorod area) for many years . Decommissioned in 1965, the 102.5 metre long paddler was scrapped after failed attempts to find a saviour after being badly destroyed by fire in 2003. 2002 saw the final demise of two of the famous Dresden "White Fleet " after many years' lay-up. Although the local operators have, where possible, restored the available paddlers and most of their fleet is now over 100 years old, the condition of these two vessels was beyond economic repair. This was made worse by the act that considerable alterations would have had to have been made to their narrow hulls to meet modern stability regulations. Fortunately the oscillating engines were removed from each vessel and are now in storage with the ultimate aim of finding or building new hulls for further use. 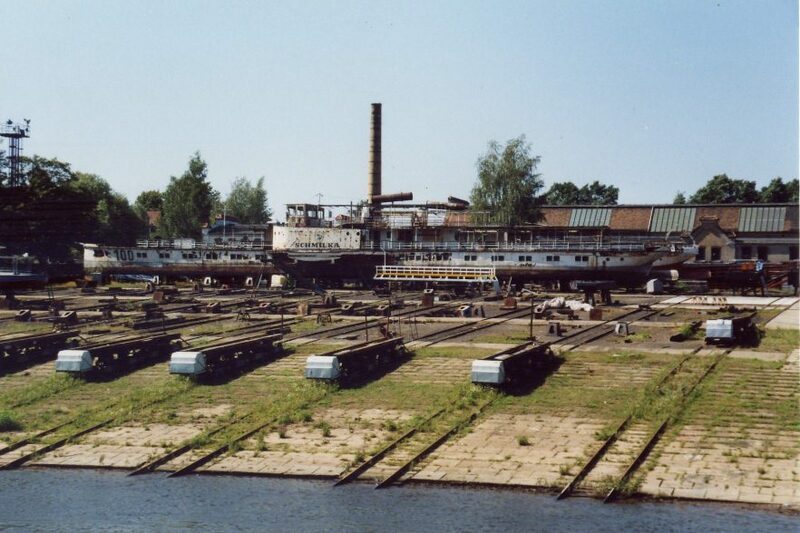 The Laubegast yard on the River Elbe just upstream of Dresden has seen many paddle steamers built and refurbished, including the majority of the current fleet sailing from Dresden, but in 2001 it was host to two paddlers which were not destined for a return to service. In poor condition after many years out of service, it was decided to scrap Schmilka (seen with Junger Pionier behind). Photo above kindly supplied by John Woodhams who got a magnificent view of the yard from a passing steamer. The former Dutch paddler (ex Schoonhaven, built as Culemborg in 1895) served as the clubhouse for the "Rhenus" Rowing club at Andernach on the Rhine in Germany from 1962 to 1999. 2011 : One of the most iconic ships moored on the Mississippi, latterly as a casino was scrapped in 2011. "Admiral", a former paddle steamer built in 1907 as a railcar ferry PS Albatross crossing the Mississippi at Vicksburg, was radically redesigned as a luxury passenger ship in Art-Deco style over 1938-40. The St Louis based cruise ship remained a steam paddler until 1974 when she was converted to diesel and screw. her engines were removed in 1979 after her decommissioning. 2009 : Former railcar ferry on the Detroit river crossing from Detroit to Windsor (Canada) between 1884 and 1956 after which she was kept in reserve. Served as a floating restaurant at Detroit where its main feature was the railcars stored on her deck. After the restaurant closed she was inactive until moved to Erie in 1999 but remained derelict and sank on December 25th 2005. She was then moved to Buffalo but no progress was made and she was scrapped in 2009.